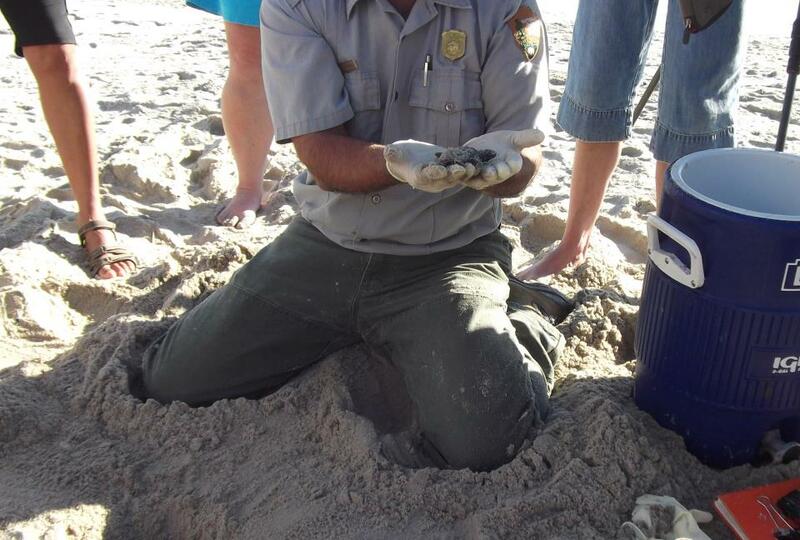 If you’re in the right place (Hatteras Island) at the right time (during nesting season), you might be lucky enough to witness baby sea turtles hatching and making their journey home (to the sea). Thanks to Vickie Kay Rowe Willard for submitting this photo to our Facebook page! Sea turtles visit the Outer Banks in early to mid summer to lay eggs. The sea turtle nest cavities in the sand are 18-22 inches deep, on average, and contain between 75-150 ping pong-sized eggs. Those eggs hatch 55-80 days after they are laid. Most adult sea turtles nest every other year or every three years, laying 3-4 cluthes (nests) of eggs during nesting season (May-August). Turtle crawl – The unique pattern left in the sand when a sea turtle crawls to or from the sea. Some people say that the pattern resembles tractor treads. Check out N.E.S.T. on the Outer Banks for more information on sea turtles and how you can help while you’re here!